Includes Encyclopedia Brown, Boy Detective and Encyclopedia Brown and the Case of the Secret Pitch. Encyclopedia Brown looks like the usual ten-year-old boy. Actually, he is very unusual. Encyclopedia is a boy who really uses his eyes, his ears, and his head–and his head is full of facts. As for Idaville, where he lives, no grownup, boy, or girl ever gets away with breaking a single law there. That is because Chief of Police Brown's most difficult cases are solved by his son at the dinner table. 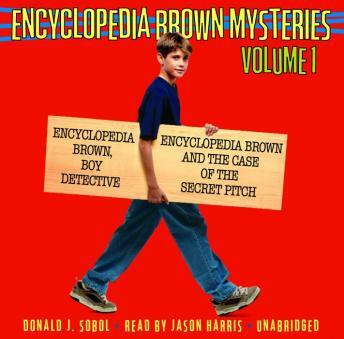 Encyclopedia Brown will keep kids guessing until the last page of each chapter book mystery. I have 2 girls (3 and 5 yrs). I was worried that they would be too young to understand or enjoy these stories. However, they really liked them. The first time through the episodes they were not able to pick up on the clues, but after listening to it again and again (and again…and again…and) they had LOTS of fun remembering what the special clues were and yelling them out as we drove along. So I can safely recommend these stories to parents of younger children…however, be prepared to listen to them an awful lot! Enjoyed by our elementary age kids. Very nostalgic for parents. We recommend this ced.